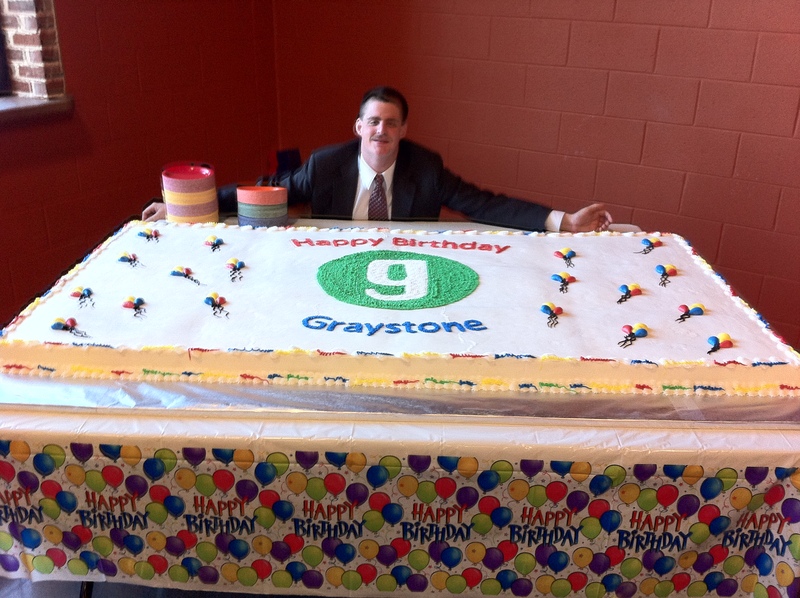 Yesterday’s 6th Birthday Party was one of the most fun and exciting services at Graystone in a long time. I absolutely loved the old pictures and video footage on the screens as “Kyle and the Band” sang “Oh Happiness”. Great memories. I hope to post the video on my blog sometime soon. I loved the party song clips that led into the opening song, Party. BTW, “Let’s Get It Started” by the Black Eyed Peas was the song that we played at the beginning of the Grand Opening service on October 17, 2004. I absolutely loved hearing via video, “What people love about Graystone Church?”…the music, volunteers, the hearts of the people, authenticity, community focus, children’s ministry, etc. I hope to post this video in the near future as well. I loved Heath interrupting me during the intro to my sermon. Heath is a pretty funny guy and the secret sauce of Graystone Church. Every church really does need a Heath. But they will have to find one of their own, because I am not letting ours go. It was pretty obvious that during Heath’s “6 Things he loves about Graystone” spill that he was looking for a date. And I think it worked. There was a first-time visitor single lady who is convinced that she and Heath are meant for each other. Seriously. I heard that she also likes dressing up in character costumes and her favorite movie is The Elf. BTW, I knew that Heath was going to interrupt me, but I had no idea what he was going to say. It was total add lib, and he had me rolling in the 9:15 service. In the 11:00 service, I was a little more prepared and left him speechless a couple of times. I absolutely love the new t-shirts, I love my church, and seeing hundreds of people wear them. Let me encourage you to wear yours proudly and use it as a tool to reach out to the community and invite people to Graystone Church. I absolutely loved the all you can eat cake. I had more that one piece and Tempa’s and Suzanne’s were both delicious. I’m pretty sure that the 24 square foot cake is the largest one that I have ever seen. THANK YOU so much ladies for using your incredible talents to make our 6th Birthday such a special day. 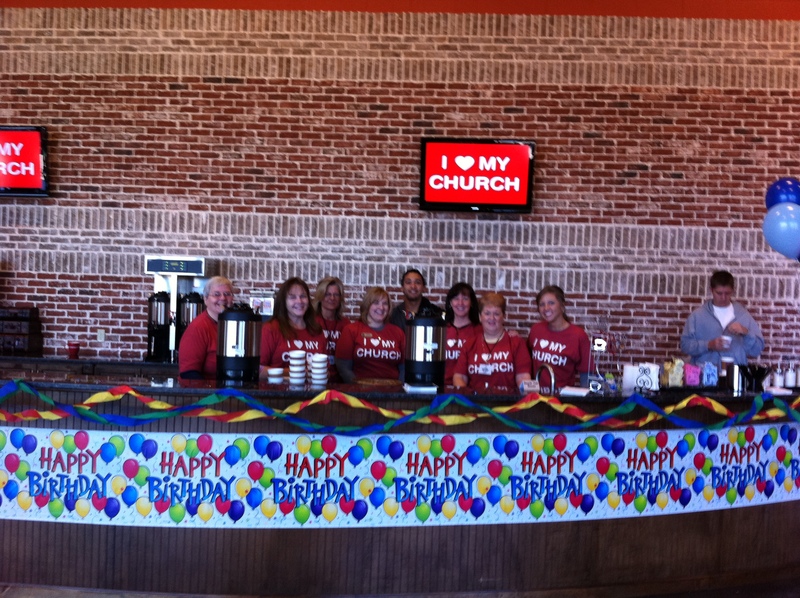 I also loved all the decorations…banners, balloons, window paint, etc. Thank you to all those who helped decorate. 2. A team approach to ministry… we have 14 staff and over 500 volunteers. 4. An Outward Focus…we have averaged over one baptism every Sunday that Graystone has been in existence. 5. Our Children’s Ministry…It is one of the best IN THE WORLD! 6. The best is YET to come! Check back later for Monday Download (Part 2). I have a plethora of “important” things to catch up on. Rev. Barker is one of my heroes. My “‘I love my church” shirt has already paid off. Someone at lunch at Moes asked me where our church was and he said he was planning on bringing his family next week. That’s awesome Chris…too cool. I look forward to hearing my more stories like yours.